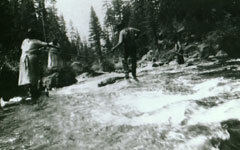 Maidu Fisherman, Credit: California Department of Parks & Recreation, undated. "The bulk of California's Indians were conquered, and died, in innumerable little episodes rather than in large campaigns ... it serves to indict not a group of cruel leaders, or a few squads of rough soldiers, but in effect, an entire people; for the conquest of the Native Californian was above all else a popular, mass, enterprise." Vaatxarakaan, a Karuk elder from the village of Vunxarak near the Klamath River, had a dream about a strange, pale people, lost high in the mountains. When he awake, he remembered the dream. Immediately he organized a search party to look for the place, which he thought he recognized. The search party discovered and rescued a group of white men who were lost in the mountains of what would soon become the northwest corner of the new state of California. It was the 1840's and the lost travelers were the first of tens of thousands that would soon stream to the western states looking for gold. For some of the Native communities, the arrival of the white men was wonderful news. Captain Truckee of the Paiute of the Great Basin and the eastern Sierra Nevada's reminded his people of an ancient tale of the return of their long-lost whiter brothers and how the races would live together in peace. The Yurok of northwestern California believed that before the Native peoples arrived to live by the river thousands of years ago, the land was populated by a white race known as the Wa-gas, who left for the north after sharing their arts and sciences with the new settlers, promising to return one day. Unfortunately the ancient stories must not have referred to these white settlers. "Soon the sad mistake was discovered to our sorrow, when the men began to debauch our women, give whiskey to our men and claim our land that our forefathers had inhabited for so many thousands of years ... We no longer termed them Wa-gas but Ken-e-yahs, which means foreigners, who had no right to the land and could never appreciate our kindness," wrote Che-na-wah Weitch-ah-wah, a Yurok woman, years later. Estimates of the number of Native peoples prior to the arrival of the white man, in what is now known as California, range from 310,000 to 705,000. Most agree that the population in 1845 had dropped to 150,000, a tragic consequence of the mission systems and the diseases introduced by the Spanish and Mexicans. The miners and ranchers who came in the Gold Rush years decimated the rest. By 1870 the number of Native Americans had plummeted to 31,000, according to California census. These peoples were, by an large, peaceful peoples who lied by hunting and gathering. They practiced little agriculture and used little in the way of metals. There were exceptions; some communities in the northwestern and southeastern corners of California were more warlike than the others, some peoples in the Colorado River area practiced farming, and indeed many did some small-scale mining. Over a hundred small mines and quarries utilized by Native Californians have been identified in the state. Quarrying was very common to excavate soapstone, which was turned into pipes, bowls and plates. Obsidian was used to make arrow points, while clays and granite were mined throughout the state to make pots. Salt was extracted by the Kamia of the Imperial Valley and quartz crystals were used by the Yana as luck charms. Chalk was dug up by the Paiute for use as face paint as was manganese by the Pomo and mercury by the Costanoans. Turquoise was also mined by the Pueblo peoples who traveled to the mines in San Bernardino from Arizona to New Mexico. But there is no evidence of the local excavation or use of gold. This probably saved many lives because it postponed the Gold Rush by a couple of centuries. Once gold was found in 1848 and promoted by President Polk, the stampede of '49 began and the days of the local communities were numbered. The arriving settlers referred contemptuously to California's Native peoples as diggers, considering them less than human, and treating them in a rough, racist manner. The name itself is derived from the fact that most Native peoples were hunter gatherers who lived off roots and seeds that they dug up in addition to trapping deer and catching fish. These peaceful peoples were bewildered when the settlers arrived and set about tearing up the river beds and hillsides for mining and chopping down the forests for firewood to keep themselves warm and to cook, devastating the traditional food supply. Around the Tahoe basin, for example, the miners raised a hundred-mile stretch of forests for firewood. Ranchers, who settled in places like Sonoma, completed the rest of the devastation.